Fluor Field in Greenville is home to the city’s baseball team, the Greenville Drive, a Class A affiliate of the Boston Red Sox. The 5,700-seat stadium opened in April of 2006 and honors the home of the Red Sox, Fenway Park, in its design. Details reminiscent of Fenway include Pesky’s Pole, a right-field foul pole; its own Green Monster, or giant green wall in left field (Fenway’s is 37 feet tall while Fluor’s stands at 30 feet); and a manual scoreboard. An exhibit of Greenville’s baseball legacies was added to the park in 2007. Fluor Field serves as an anchor for Greenville’s revitalized West End neighborhood and was in fact originally called West End Field. In 2008, the ballpark was renamed “Fluor Field at the West End” in honor of Fluor Corporation, a locally-headquartered engineering and construction firm that helps support the Greenville Drive as its corporate partner. 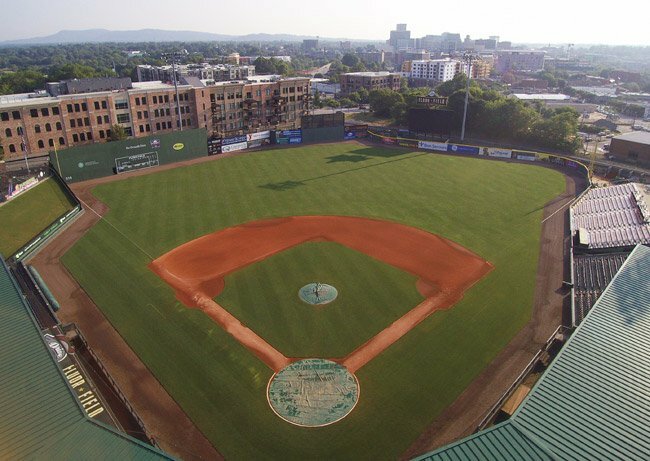 While the city invested $7.5 million in public funds to pay for the land and supporting infrastructure, the stadium itself was paid for by the owners of the Greenville Drive. Ten million dollars in upgrades are now planned for the park, however, of which half are to be covered by taxpayers. Eventually the field will be taken over by the city, which plans to use accommodations and alcohol taxes to maintain it. The Southern Conference Baseball Tournament was held at Fluor Field in 2009 and again in 2013.